Its that time of year again. The temperature is dipping below zero througout the day and night. The sun sets before most folks get home from work. A white blanket covers the green grass and grey asphalt. Yup, its winter time! To honour this wonderfully despised time of year, I’ve created a blog entitled Snowfall: A Snow Diary. 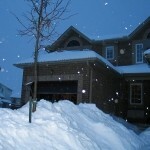 This new site will keep track of the white crap precipitation throughout the winter in the Ottawa suburb of Orleans. It doesn’t sound exciting? Well let me prove you wrong and head to http://snowfall.gareau.org to see for yourself. I’ll be waiting with glove covered hands to welcome you.